Heat oil in a frying pan, add the onions and fry over a low heat for 15 minutes until golden brown and caramelised. 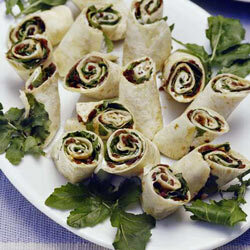 Spread a little goat's cheese on each tortilla, cover with onion and top with rocket. Roll up and serve or keep in refrigerated in an airtight container.